It’s Delilah’s seventh birthday and what could be more fun than a birthday surprise! 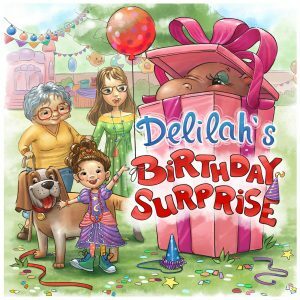 When Delilah wakes to the excitement of her big day she is looking forward to a party with all of her friends complete with hats, noisemakers, decorations, and games. But, when Delilah’s Grandma shows up with a special birthday present Delilah can’t believe her eyes. What is this extra special present Delilah’s Grandma brought? That’s the surprise! I grew up as an only child and had difficulty relating to people my own age. Adimittedly, being an only child can get lonely at times and leave a person feeling a bit like an outsider. I thought how fun it would be to create a character who is an only child in a nontraditional household and gets a “buddy” for a birthday present. That friend just happens to be a hippopotamus from her eccentric grandmother. I wanted Delilah to be able to feel unique and special, when all she ever felt was “different or weird.” I wanted to depict a situation that may not be seen as “typical” in a fun way. Delilah is a fun, tom-boyish, adventuresome, and curious seven-year-old. She is also an only child living with her mom and grandma. She is a little bit “different” than the other kids in that she is wise beyond her years and can come off like a mini-adult. Yet, she still likes to play and be a kid. Delilah is also very warm-hearted and loving which, shows in how she takes care of Louise (her hippo). Louise came about because I wanted Delilah to have an unconventional pet that was unique and different. I wanted two characters who had their own quirks to come together as friends. Danielle grew up with a passion for all things literary. She first put pen to paper writing articles for a newspaper she designed and created during elementary school. Danielle's creative channels evolved into writing poetry, short stories, essays, and children's books. When not writing her own material Danielle loves reading everything and anything she can get her hands on especially mysteries, suspense, and historical fiction. Some of Danielle's other talents include finding new and creative ways to use sarcasm, spilling/dropping things, being supremely weird without even trying, graphic design, and photography. Danielle attended California State University Northridge where she majored in Psychology and minored in Child Development. She continued her educational pursuit and attended Phillips Graduate University where she earned a Master's Degree in Psychology with a dual emphasis in Marriage and Family Therapy and Professional Clinical Counseling. Months after graduating with her degree, and growing more miserable every day that brought her closer toward a career she truly didn't want, she finally realized writing was the only career that would make her happy and nourish her soul. Danielle is a proud member of the Society of Children's Book Writers and Illustrators and the Alliance for Independent Authors. She is now gleefully concentrating full time on bringing to life her stories and sharing them with the world. Danielle currently resides in Los Angeles, California.